This Week in Rap: Offset Goes Solo, Lil Pump’s Cartoon World, and MoreYoung Thug is now a genre, Eminem rarities are officially available, rap veterans find new ways to shine, and more. By Cancelling The Punisher, Netflix Has Made an Enemy of EminemHe’s not afraid to take a stand. Three Weeks of Unseasoned Rap Beef: Eminem vs. Machine Gun Kelly vs. G-EazyTheir beige beef has hit critical mass. Why Is Eminem Rapping About Leaving Hickeys on Rihanna’s Neck?Samantha Ronson called his new song lazy and misogynistic. Eminem’s Machine Gun Kelly Response Is the Best He’s Sounded in Half a DecadeMGK never really had a career. But this has surely ended what little was left of it. What Is Eminem Going to Do When He Runs Out of People to Blame?Apparently, everything is everyone else’s fault. Bon Iver’s Justin Vernon Isn’t Thrilled About His Song With Eminem: ‘It’s Tired’He features on “Fall” off Eminem’s surprise new album, but doesn’t want to be. Eminem Calls Out Everyone on ‘The Ringer’ and It’s Actually Pretty FunHe’s not mad! Eminem Just Released a Surprise Album Called KamikazeThere are skits, the new Venom song and everything. Eminem Tells All of Boston He Wants to Date Nicki MinajYou guuuyyyssss, he stood up. Coachella Releases Full Schedule With Set TimesFigure out who to see and when, before Beyoncé takes the stage. Why Eminem’s ‘Till I Collapse’ Is Still a Huge Workout FavoriteIt’s well over a decade old, but going strong. Well, This New Eminem Video Is a Real Valentine’s Day BuzzkillHave you missed Eminem “acting”? Coachella 2018: Beyoncé, the Weeknd, and Eminem Headline This Year’s FestivalThe massive festival will also feature performances from Cardi B, SZA, Haim, Tyler the Creator, War on Drugs, Fleet Foxes, and more. Eminem Tests Out the Infinite-Monkey Theorem in ‘Walk on Water’ VideoIt was the best of times, it was knees week, arms are heavy. Rap Expert Donald Trump Jr. Mourns the Loss of FreestyleThe First Son criticized Eminem for preparing a response in case the president reacts to his new album. 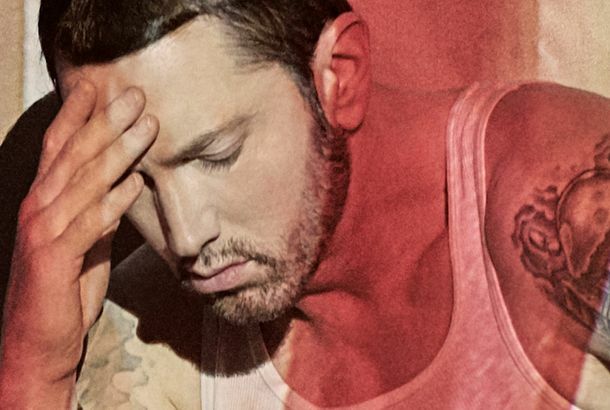 On Revival, Eminem Tries Everything, But It Doesn’t Always WorkIt’s like he’s second-guessing his place in the rap game. On ‘Like Home’ Eminem Still Thinks America Can Be SavedIsn’t it nice to think so? Eminem’s 9th Studio Album, Revival, Has ArrivedMarshall Mathers rises again. Joyner Lucas’s Viral Hit ‘I’m Not Racist’ Is ExhaustingHe’s technically talented, but his message doesn’t really apply to the current state of the world. 6 Best New Songs of the Week: Taylor Swift, Eminem, Dashboard ConfessionalThe best song on Taylor Swift’s Reputation renders those obituaries of her songwriting skill irrelevant. Eminem Sounds Uncommonly Quiet on ‘Walk on Water’The Beyoncé-backed track feels more like a prelude than an actual song. Hear Beyoncé and Eminem’s New Song, ‘Walk on Water’Why walk when she could just float? Larry David, Tiffany Haddish, and Chance the Rapper to Host SNL Next MonthTaylor Swift and Eminem will be musical guests. Eminem Is Taking On Donald Trump, But Does It Matter?Maybe he could make a difference. Eminem Rips Donald Trump in Scathing Freestyle Rap During BET Hip-Hop AwardsHe also has a message for any Eminem fan who supports Trump. Stan, a Word Originally Coined by Eminem, Has Now Been Added to the DictionaryCongratulations to the Beyhive, Rihanna Navy, Pine Nuts, Beliebers, and Barbz alike.